On average collaborative divorce costs $7,500. 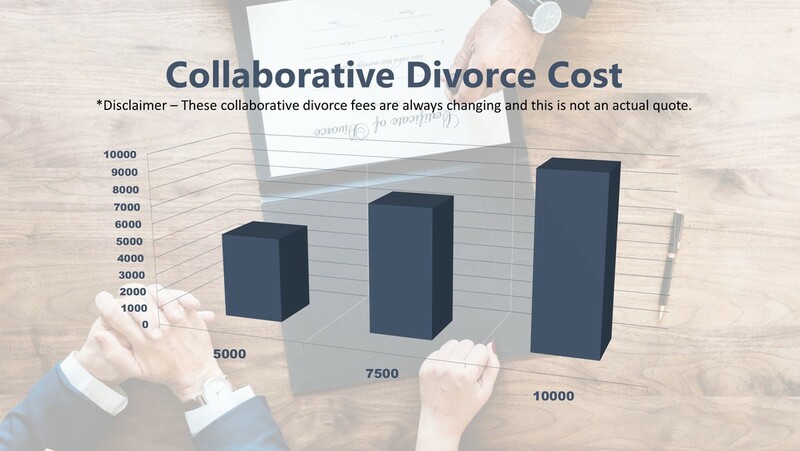 Collaborative divorce costs ranged from $5,000 to $10,000 per spouse in the US for 2019, according to Equitable Mediation. However, Canterbury Law Group has navigated many divorce collaborations for less than $10,000 in legal fees per spouse. This is a far cry from the tens of thousands of dollars that other couples will inevitably spend in contested divorce litigation in a court of law, not to mention the high emotional cost in traditional divorce cases. *Disclaimer – These collaborative divorce fees are always changing and this is not an actual quote. If you need an experienced collaborative divorce lawyer in Arizona, contact Canterbury Law Group today to start your initial consultation. How Much Does Collaborative Divorce Cost in Arizona? On average, Arizona collaborative divorce costs about $10,000 per spouse. Unlike traditional litigated divorce cases where both sides are dug in, and legal meters are running full bore each month, collaboration is quite the opposite. A team of family law professionals is assembled and there is a group push towards resolution. Usually completed after 3 or 4 group meditation sessions, and within 60 to 90 days, you will have your divorce in hand almost overnight compared to your friends and colleagues slogging their way through a multiyear litigated divorce costings them tens of thousands of dollars. Do not be penny wise and pound foolish. Society has evolved in all facets of life—including divorce, why keep doing things in a time consuming and expensive way, when instead you can go through a transformative process of collaboration where only you and your spouse make the big decisions, and not a stranger in a black robe. Collaborate, do not litigate. Canterbury Law Group should be your first choice for when you need the best collaborative divorce lawyers in Arizona including Phoenix and Scottsdale, Arizona. Our experienced Arizona family law attorneys will work with you to obtain the best possible outcome. You can trust us to represent you fully, so you can get on with your life. Call today for an initial consultation!